From the beginning of Time human beings, from the most primitive to the most culturally sophisticated, have followed and recorded the natural rhythms and cycles of the Earth. The intricate dance between the Earth and the other heavenly bodies has been the source of wonder and amazement giving rise to innumerable stories and myths all over the world. Many of these stores are still passed on today. Ancient people of the Earth were concerned with these natural rhythms and cycles because their lives and livelihood depended on them. In certain times of the year food was plentiful in certain regions and not in others. At certain times the rains would come, at others they could expect the heat and drought. They also observed that fertility was somehow linked with the cycles of the Moon. According to these various cycles of Nature then, people began to recognize a Cosmos of increasing complexity - repeating patterns and cycles enfolded within even larger cycles of order. The cyclic movements of the Sun, Moon, Planets and Stars indicated a Natural Order to Reality that provided our ancestors with meaning and the reassurance of continuity. Heaven and Nature touched every aspect of their lives. Not only did their astronomical observations indicate when to plant their crops and when to harvest, but also where to locate their temples, how to design their homes and even how to orientate their cities. These people occupied a living and intelligent Universe that governed their lives. Survival and success then, depended on how well one could read the celestial signs. As a brief review of the some of the most basic of these natural cycles, we will begin with the rotation of the Earth on its axis. Because the Earth rotates one complete revolution every 24 hours we observe the reoccurring periods of day and night. Unfortunately there are surprisingly large numbers of people today that still do not understand that this daily cycle is caused by the motion of the Earth and not by anything the Sun is doing. This could somewhat be explained by the fact that our linguistic customs lag centuries behind our scientific understanding, and we continue to speak in terms of sunrise and sunsets. Be that as it may, the next cycle we will look at is based not on the motion of the Earth but of the Moon. The Moon revolves around the Earth every 29.5 days, giving us the concept of the month as it appears in its different phases from New Moon to Full and once again back to New. Then there is the observable cycle of the year, as the Earth dances around the Sun in an elliptical orbit taking 365.25 days to complete one revolution. As people continued to observe the heavenly bodies they also began to notice that some of the bright lights in the sky moved while others stayed relatively stationary. These wandering bodies we have come to know as the planets, and various people all over the world took a special interest in their particular movement and cycles, spawning a huge number of stories, myths and legends. To those early astronomers who kept records of the movement of the Sun, Moon and Planets one of the greatest mysteries that they observed was the fact that every year they would wait for the Sun to appear on the Spring Equinox or Winter Solstice at a specific place on the horizon signaling the New Year. Over time they were dismayed to find that the Sun no longer appeared in the same place it did just 70 years before, but had moved one full degree (the equivalent to the diameter of the Sun - times two). This slow movement, called the Precession of the Equinox, causes the Equinox Sun to appear to slip backward against the backdrop of the stars. Astronomers have now managed to figure out that the Earth is not a perfect sphere by any means. Its actually a bit flattened at the poles and has a bulge at the equator. As a result, the gravitational pull of the Moon and the Sun exert an uneven influence on the Earth. Their gravitational forces try to pull the equatorial bulge toward them. Because the Earth is spinning these forces make the axis of the Earth wobble, shifting ever so slowly. Gradually the polar axis that was at one time aligned with a particular star begins to shift until it is aligned with another star. Right now the Earths axis at the North Pole points to the star Polaris  which appropriately we call the Pole Star. But 5,000 years ago the north celestial pole aligned to the star called Alpha Draconis. Eight thousand years in the future the pole star will be Vega. This Precessional movement then is the same motion responsible for the shift of the location of the Equinoxes and the Solstices. 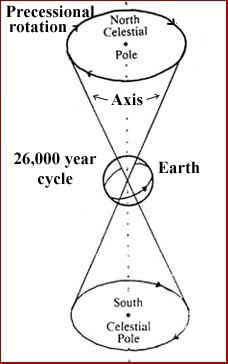 The ancient astronomers detected the long term Precessional motion of the Sun through the back drop of the constellations and calculated the length of this Cycle to around 25,600 to 26,000 years. This means that the Sun that marks the Spring Equinox which now appears in front of the background of stars in the constellation of Pisces, in about 500 years will rise in the constellation of Aquarius. It will continue to shift backwards through the various constellations Capricorn, Sagittarius, etc., until in about 26,000 years it will arrive back to the exact same point in Pisces. The understanding of this Precession of the Equinox then gave rise to the many myths and legends of the different World Ages. As the Processional movement continued to shift the Equinox into a new constellation, various cultures perceived this as a New Age or New World. As the Spring Equinox Sun appeared to rise in the constellation of Taurus, people perceived this as the Age of the Bull; the Age of the Ram as it rose in the constellation of Aries; the Age of the Fish as it rose in Pisces and so on. At one time many civilizations on Earth were aware of this natural cycle of the Earth and incorporated it into their cosmologies and concepts of Time in various ways. Each one reflecting a slightly different interpretation and meaning, but in their different ways they all held the Precessional Cycle as involving nothing less than the Cosmic process of Lifes evolution, subtly influencing all of Earths Life Forms to move to higher levels of organization and complexity. 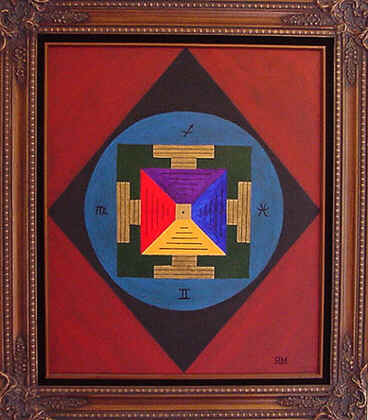 It came to symbolize the Spiritual Process of Unfolding Consciousness on our planet. What is important here is that this belief was actually based on an observable astronomical cycle: every 72 years the Solstice and Equinox Sun appeared to move backward through the constellations one degree - as a hand on a clock indicating the hours of the day. In this Cosmic Clock however, the hand or marker in motion is the specific location of the Equinox or Solstice Sunrise, while the face of the clock is represented by the relatively stationary constellations of the stars. With this in mind then, we will now turn our attention to how this Precessional Cycle became incorporated into the Mayan Cosmology and how it relates to their long count calendar and specifically to the year 2012. Perhaps more than any ancient culture that we are aware of at this point, the Mayan people were obsessed with Astronomy. Not only were they able to project their astronomical calculations thousands of years forward and backward in Time, but developed a recyclable Venus calendar that was accurate to one day in 500 years and a table of eclipses that still functions today. They also accurately calculated the solar year out to four decimal places. To accomplish these impressive computations they created a sophisticated system of mathematics utilizing place value and the concept of the zero. And all this while Europe was still wandering around in the Dark Ages. In a complex culture such as we find with the Maya and considering it spanned a period of almost a thousand years, it is important to remember that there arose different belief systems at different times, some of which were coexisting at the same place. Just as if we were to look at the demographics of say modern New York city, we would find Jews perhaps living besides Moslems, Protestants and Catholics - all entertaining different belief systems. And so its appropriate here to limit our considerations of the Mayan culture to only those beliefs that lend meaning and significance to the auspicious date indicated in their long count calendar - Dec.21, 2012. As we more sharply focus in on this date, we find that one of the indicators to its probable significance is that it specifically designates the Winter Solstice. As this is our starting point in our analysis then, lets take a closer look as to what this might mean. First of all it is good to be aware that around the world in various past cultures, each one designated a specific time to mark the beginning of their New Year. In ancient Sumeria and Babylon the New Year began with the Spring Equinox. In Israel the New Year was gradually shifted to the Equinox in the Fall, while in Northern Europe, New Year was celebrated at the time of Winter Solstice. We still observe this particular New Year tradition, but add a few extra days so that now our New Year begins on January 1st. In the context of this tradition then, the Winter Solstice on December 21 was celebrated as the Suns birthday. It is the longest night of the year and therefore the shortest day of the year. It represented the ultimate power of the dark forces of Nature: the long winter night when things appeared to be dead and still. And out of the depths of this longest night the new Sun was born. From this point on, the power of the light grows in strength and the days slowly begin to grow longer. The Winter Solstice then inaugurated the birth of a new solar year. The Sun appeared to come back from its annual trip to the South and begins its slow return in to the Northern Latitudes. The sunrise on December 21 was believed to be like the first sunrise, and the start of the New Year was in fact a celebration of the beginning of Time. With this particular context in mind, we are now prepared to examine more closely the reasons why the Winter Solstice in the year 2012 is so important. In the Mayan long count calendar a cycle of 5,200 years ends on this date, and it just so happens that it also points to a rare astronomical alignment. In fact this alignment only happens once every 26,000 years. The auspicious year of 2012 indicated in the long count calendar illuminates the fact that the Precessional movement of the Winter Solstice Sun will gradually bring its position into alignment with the very center of our Galaxy. For the Maya, this is like the last stroke of Midnight on New Years Eve, only in 2012 the New Year is the New Galactic Year of 26,000 solar years. The Galactic Clock will be at zero point and a New Precessional Cycle will begin. At this point you may be wondering what is so important about the Milky Way and why were the Maya even concerned with it? Our scientific culture has finally come realize that our planet, the Sun, and the entire solar system had its origins at the center of the Milky Way Galaxy. We also have recently found that our Galaxy is 70,000 light years in diameter, with most of its 400 billion stars concentrated in the great central bulge. Equipped with ultraviolet, x-ray and gamma-ray instruments, plus infrared telescopes most astronomers are now convinced that at the center of our Galaxy is a massive black hole the unimaginable seize of millions of our suns. This is where Science and Mythology truly meet. For what the center of our Galaxy may represent in terms of energy and the properties of time/space, no one has a clue. But to the ancient Maya the Milky Way Galaxy represented the Great Cosmic Mother from which all Life was birthed. They saw our Galactic Mother stretching out across the night sky and somehow recognize the place where we all had come from. And the great central bulge at Her center they perceived as the Cosmic Womb. Within the central bulge there is what looks like a dark corridor, known as the dark rift. To the Maya it was referred to by many names but the most pertinent here is their reference to this area as the "birthing pace". Are we beginning to get the picture here? 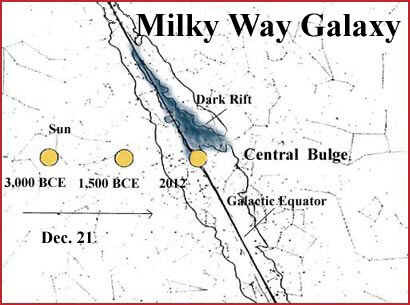 Considering then the significance of the 2012 date in the Mayan calendar, it has been discovered that this year specifically points to a period of time when the December Solstice Sun aligns with and arises out from the backdrop of the dark rift, the "Galactic Birth Canal" in the central bulge. It's as if the Sun is actually being birthed anew from the Galactic Womb. The Mayan Cosmology was not written in a book, but in the very stars above their heads. The meaning of this story was not revealed through the study of obscure interpretations, but through correspondence of associations assigned to the individual parts in the story. All we need to do is recognize those original associations and the story unfolds all by itself. Just as in our culture we have built up associations between the Winter Solstice, the New Year and the birth of Jesus Christ "the Son of God" who came into this world as "a savior of mankind". With the Maya we have discovered another story associated with the Winter Solstice, the New Year and the fate of people on Earth. The astronomical alignment of the Precessional Cycle of the Winter Solstice and Galactic Center represents the "Zero Point" on the Cosmic Clock, thus marking the beginning of the New Age in our evolutionary journey in consciousness. It tells us that a New Sun is born, a New Year has dawned, a New Galactic Cycle has begun, and the transformation of our World is well underway. Just as the Earths equator divides the planet into two hemispheres of North and South, the Galactic Equator is the astronomical term for the dividing line of the Milky Way, separating the Galaxy into two halves. Similar to the time of the Equinox when the Sun appears to cross the Earths Equator and thus enters into a new hemisphere, so too in 1998 the Winter Solstice Sun began to cross over the Galactic Equator. Considering that the Sun is so large (about one half a degree wide) and the motion is so slow, our Sun will not be completely across the Equator and fully into the new Galactic Hemisphere until 2018. So we need to understand then that the Mayan 2012 date is simply an indicator to this 20-year period of transition  the birthing process of the New Age and the beginning point of the New Precessional Cycle of 26,000 years. I find it almost the height of irony that the descendants of those white Europeans who came to the "New World" to bring enlightenment and salvation to the indigenous population, would now find buried here in some remote jungle a stone calendar/clock telling them what Time it is. A calendar or clock not foreign to their own cultural background, but one that actually incorporates and fulfills their most expansive vision of cyclic Time, the Precessional Cycle. This "Great Year" was long known to the Sumerians, Babylonians, Egyptians and the ancient Greeks but lacked a point at which it began or ended. Somehow down through the Ages that knowledge had been lost. Perhaps the greatest gift the Mayan culture has given our world is the Zero Point to the Precessional Cycle of 26,000 years. Through the 2012 date in their calendar, they have indicated the importance of the Galactic Equator and it relevance to the Precessional Cycle, thus giving us the ability to now pinpoint the exact Time on our Galactic Clock. Over the span of the 20 year transitional period as the Solstice Sun crosses the Galactic Equator and moves in to a new hemisphere, we will indeed witness the falling away of the old structures and the birthing of the new. For those who have eyes to see we are actually witnessing the birth of a planetary civilization. And the very logistics involved in this process will determine that the old values of the Nation States which was primarily based on competition and exploitation will have to eventually give way to a collaborative effort, where cooperation will be the dominate social value. This will arise not out of some new political, social or economic theory but the very desire of the human species to continue to survive and be successful. Maya Cosmos, Three Thousand Years On The Shaman's Path. David Feidel, Linda Schele, Joy Parker. William Morrow and Company, New York. 1993. Maya Cosmogenesis 2012. John Major Jenkins. Bear & Company, Santa Fe, New Mexico, 1998. Beyond The Blue Horizon  Myths & Legends of the Sun, Moon, Stars, & Planets. Dr. E.C. Krupp. Oxford University Press, New York, 1991. The Adventures of Habu - Stories for Children Christianity 101 What Time Is It Anyway?